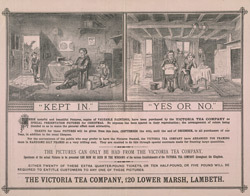 In the 19th century, with a relaxation of previously prohibitive import duties, tea began to play an important role in the Temperance Movement's battle to curb the high levels of alcohol consumption among the working classes. Meeting were held across the country in an attempt to convert drinkers from the evils of gin and beer, encouraging them to drink nutritious and wholesome tea instead. The term 'teetotal', meaning abstinence from drinking alcohol, may have derived from this movement.